Two thieves, Hefty Hugh and Lanky Len are planning to capture a monkey from the zoo and use it to steal the Queen’s crown. But they don’t know that a certain crime-busting ladybird is on holiday in the same city and overheard their cunning plan. With the help of her zoo-animal friends, she comes up with an idea that will ensure the robbers don’t get away with it! 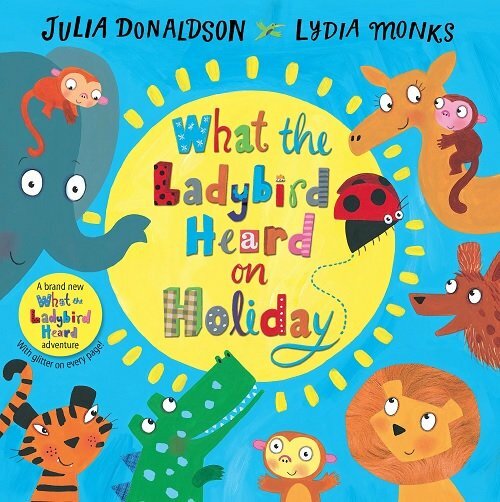 What The Ladybird Heard on Holiday is another picture book from the stellar partnership between Julia Donaldson and Lydia Monks. The illustrations are beautiful with brilliant colours and glittery textured highlights on every page. Little fingers will love searching for the ladybird on each page, as well as tracing the dashed lines to follow the ladybird’s flight path (also provides an excellent opportunity to model the verb ‘fly’ or irregular past tense verb ‘flew’). For further speech and language targets in What The Ladybird Heard on Holiday, see the list below.